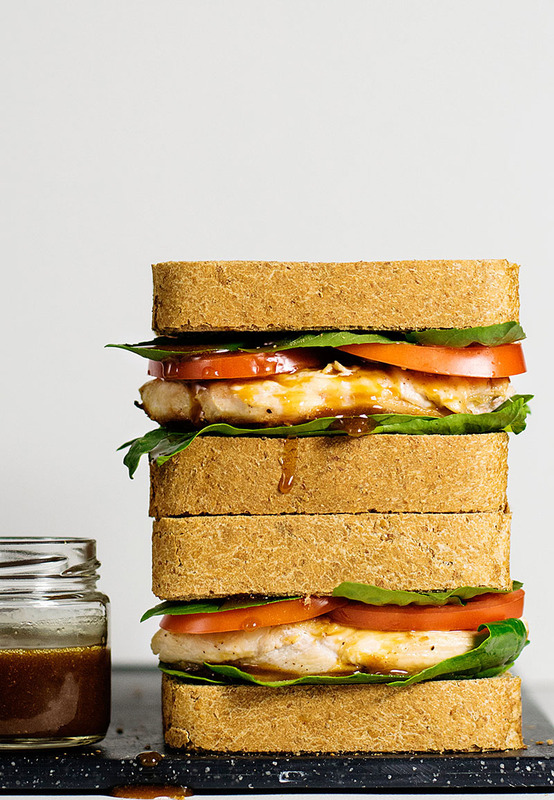 A sandwich with pan roasted chicken breast, tomato, some greens and a healthy sauce! Today’s post is about a delicious sandwich and a chemical reaction that’s called the maillard reaction. 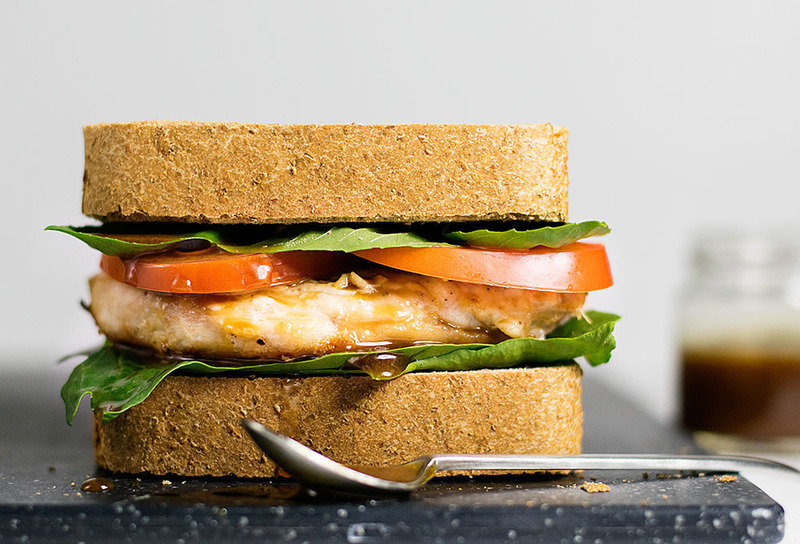 I guess you’re already wondering what a sandwich has to do with this maillard reaction… Well, what if I told you that you use this reaction almost every time you cook something? 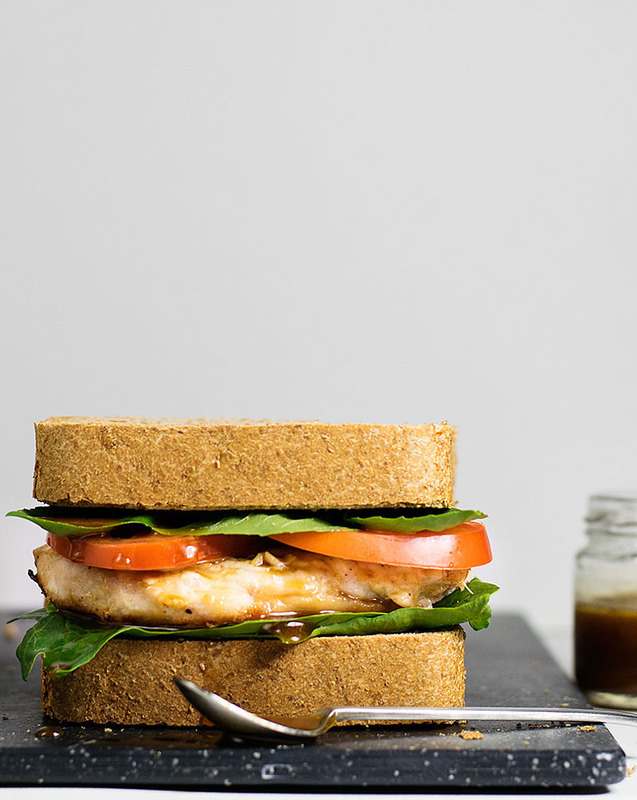 But let’s leave this for later on… This is a sandwich with a mediterranean flair, since it’s full of chicken, tomato, basil and an olive oil dressing. 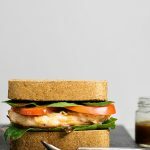 I’ve made this recipe many times using this very easy quick beer and olives bread because the addition of olives and beer gives the sandwich an extra oomph. But you can use whatever type of bread you like, preferably a whole wheat one or even a gluten free one if following a gluten free diet. And you know what? Skip the bread and use some pita or tortillas and make this into a wrap. Whatever you choose the end result will be a delicious snack, lunch or even breakfast! First you’re gonna need to cook the chicken. You can use a rotisserie chicken or boil the breast. But come on… where’s the fun in that? I prefer to sauté the breast in a skillet with a tiny amount of olive oil. I do the same thing with the chicken I use for my deep dish chicken pie – I suggest you try it, it’s awesome! And I’m not saying that because it’s my recipe; OK I do, but really, it’s awesome. So, what I do is butterfly the breast (see how to do it in this video, it’s for a turkey breast, but the method is the same) and then pound it with a millet or a heavy rolling pin to make it the same thickness. This will help in an even cooking, with no dry parts! After the good pounding I sprinkle some salt and pepper and throw it into a hot skillet until the one side is well browned. I don’t stir or anything… I just let it sit there. Then I repeat for the other side and bake it for 10 minutes in a preheated oven just to be sure it’s cooked through all the way (though you can skip this step if you’re sure that it is properly cooked in the pan). So, we’ve reached the part about the mallard reaction! Every time you apply (intense) heat on a piece of meat, then numerous chemical reactions happen at a molecular level. This is what we usually call caramelization, and you can see it with your own eyes by the change in color. You will smell it too! Meats get a nice golden brown (or even a deep brown) color, and that’s an indication of a really delicious flavor. This reaction is called the maillard reaction (you can read more about it here). Keep that in mind next time you want to cook something, it makes a whole of a difference! While the chicken is baking or resting (you should let it rest for a while) you can prepare all the other ingredients. Just wash your greens and blend or shake in a shaker the ingredients for the sauce. FYI, I sometimes, instead of this dressing, use this delicious, homemade feta cheese dip. It transforms it into a whole new recipe! Butterfly the chicken breast and pound it with a millet or a heavy object to even the surface. You want it to be approximately half an inch thick. Sprinkle with salt and pepper and cook it in a skillet in medium/high heat with a tablespoon of olive oil. Wait until one side has browned well (about 5-6 minutes) and then flip it. Cook the other side the same way. Put it in the oven to bake for additional 10 minutes and let it rest in a cutting board. Divide in two equal pieces. 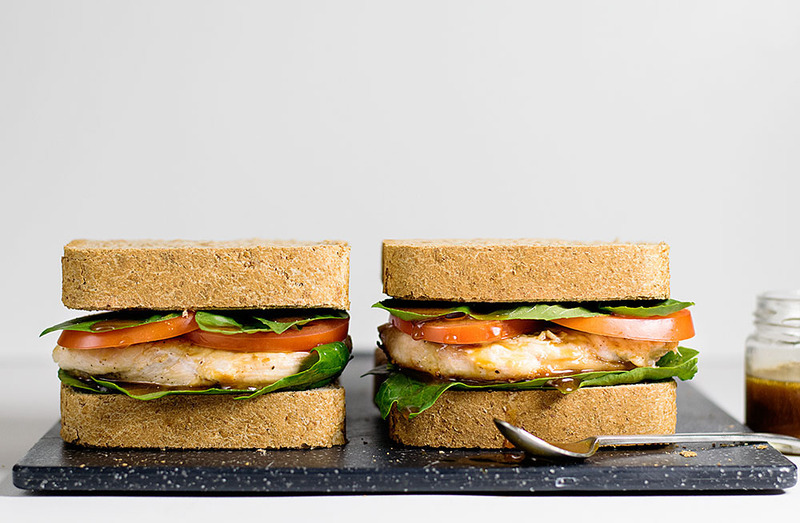 Lay some spinach leaves on one slice of bread. Put one piece of chicken on top and drizzle with some sauce. Lay some tomato slices on top, some basil leaves and drizzle again with some sauce.